I do feel cheeky asking this because I've been lucky enough to get some amazing reviews on various websites, but I'm afraid I'm still on the scrounge for more reviews! If you've read Aaron Gray and the Dragon War then please please please can you leave the book a review, either on Amazon or Goodreads (or even both)? I really can't emphasise how important this is for me as an author. You don't have to write much, just give it a rating and say something like "I liked it". If you want to write more then of course that would be amazing, and, as you know by now I feature exciting reviews and messages in the usual Friday blog slot. These are definitely the worse jokes in Breveny! Two vampire sprites are getting married. It was love at first bite. If the Taciton Forest could kill you, then it wood. Jokes in the Calmat community are only allowed if everybody gets them. I'm sorry, I'm so so sorry! At church on Sunday I was greeted by a precocious twelve year old who, for the sake of this story, I will call Hermione, as she shares certain character traits as the more famous Hermione from the Harry Potter books. I knew Hermione (church Hermione, not the HP one, keep up) was reading my book, so it was nice when she started our conversation with "I really like your book..."
Fantastic, I thought, This is going to be a good day. But? What on Earth can she have a problem with? Shut up, Hermione, you don't know what you're talking about. 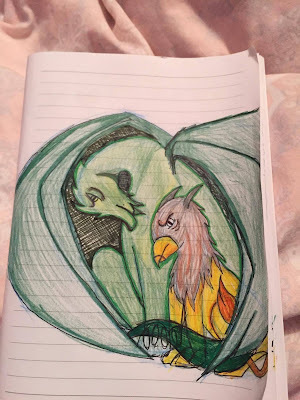 "But you know that Keythongs aren't male griffins, right? They're just griffins without wings." Obviously I thanked Hermione for her knowledge and precociousness and didn't at all tell her that she was wrong and to shut her face. She raised an interesting point, which I thought I would clarify here. Griffins as legendary creatures go back many thousands of years, arguably there were stories about griffins even before there were stories about dragons. They have the head and wings of an eagle, and the body, tail and back legs of a lion. Their front legs can be either eagle or lion, but mostly they have eagle talons at the front. At some time around the 11th Century (give or take a few hundred years), different armies would use different legendary creatures on their coats of arms. The Griffin was a firm favourite back then because the combination of lion and eagle represented courage and leadership. 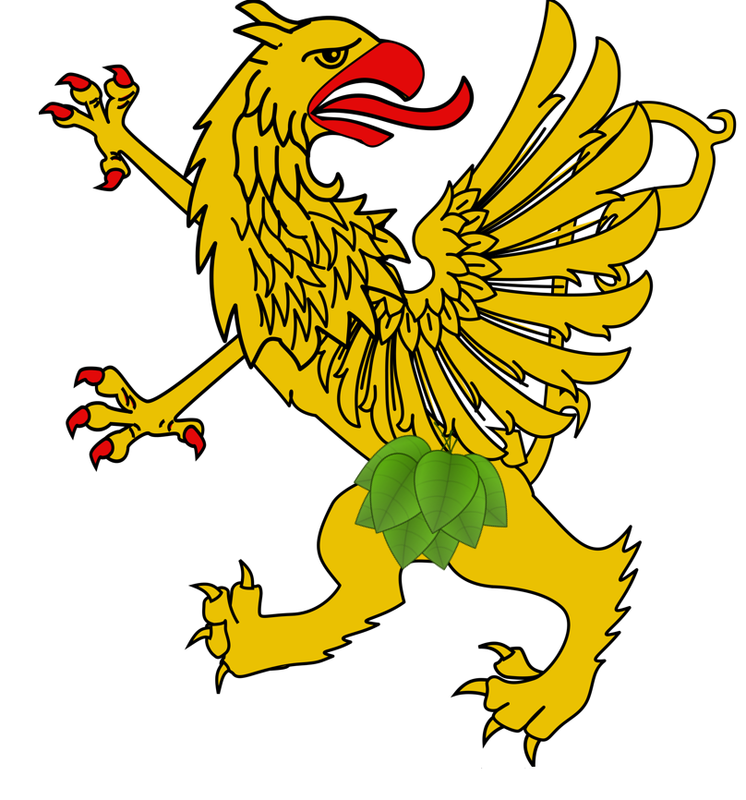 The lion's legs indicated strength while the talons represented intelligence and strategy. Lots of kingdoms therefore had the griffin on their sheilds and armour. 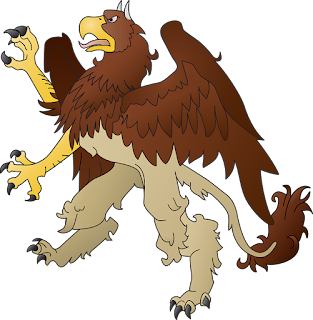 However, also popular (but not as popular as the Griffin) was another creature, known as the "Male Griffin", "Keythong", or "Alce". The Keythong, or Male Griffin, as you can see, has spikes on its back instead of wings. Some Griffins had erm... boy parts. So although we know that Keythongs are Male Griffins, and that they have spikes instead of wings, we know that traditionally there were also griffins with wings who would, at the time, be seen as male. So well done, Hermione, you're very clever. Right, you are free to ship whatever characters you want from my books. I'll even publish the fan art. Like this adorable drawing of Cecil and Alec by Beth Boreland. I'm starting to get a good collection of questions from people now, and I look forward to answering them on this blog. For now, here is the second excellent question from Abigail Patrick. How long was Aaron actually missing for and how much of a fallout was there? Like at the end of the book he and Julia are bffs but aren't people like "maybe you shouldn't hang around with the girl you disappeared with"? Time in Breveny Vs Time in Aaron's World. It's beautiful and magical and really convenient for the author. The kids can spend as long as they like in the magical world and can just pop back to their own world as if nothing had happened. It works for Narnia because all of the action takes place in the magical world, but in Aaron Gray we've got a lot of real world stuff we need to worry about. It needs to matter, especially in later books, that he disappears. Having said that, I'm not suggesting that when a day passes in Breveny an exact day has passed in Aaron's world. It's pretty close, but still different enough for Julia to question it in later books. If you want to work out roughly how long it was then you can count the days they were in Breveny. I was careful to include each night when Aaron fell asleep. How much fallout was there? Aaron had several meetings with social work professionals who tried to establish why he ran. He insisted on telling the truth, which frustrated the professionals, but Mrs Seeger convinced everyone that whatever happened he had returned much more emotionally resilient and genuinely a nicer person. Julia had not done anything like this before, and her parents were very concerned. Fortunately she had a very open relationship with her parents and they were able to trust each other. They also met with Mrs Seeger who told them nice things about Aaron. Jack also went missing on the same day, and hadn't returned. Limited resources within Social Care and police meant that the focus was almost entirely on finding Jack, rather than two kids who had vanished and reappeared unharmed a few days later. Some of this will be mentioned, but not play a huge part, in books two and three. Do keep the questions coming. They're great fun to answer! 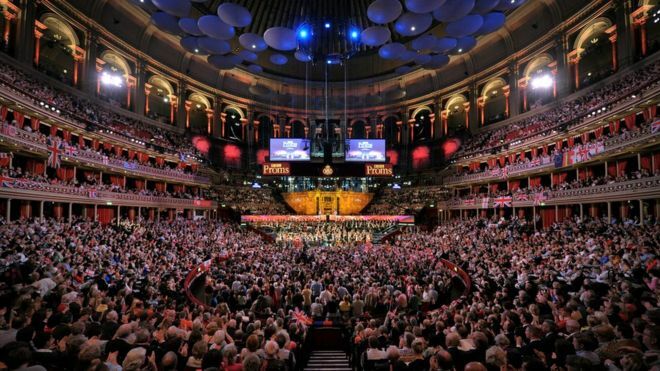 Saturday 9th September is the Last Night of the Proms, a celebration of all kinds of music and culture so for today's famous dragon I thought I'd go for something a bit more classical. The Magic Flute is an opera by Mozart (well he wrote the music anyway) that was first performed in September 1791, two months before Mozart died. In its opening scene, a prince is being chased by a dragon. The dragon is killed by three ladies, servants of the Queen of the Night. The Queen then asks the prince to rescue her daughter, and the story goes on from there. The above video was made by BBC Bristol and the Welsh National Opera. 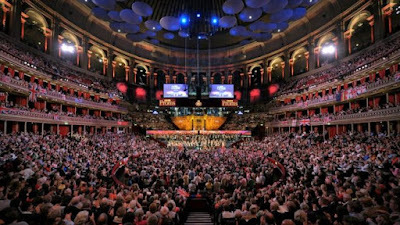 Do watch the video, and at least turn on the proms in time for "Land of Hope and Glory"! Another amazing Amazon review for Aaron Gray and the Dragon War! "This is a lovely book full of adventure and escapism. It's filled with characters you both love and love to hate and not to mention a lot of magical creatures. It's the kind of book I loved to read as a teenager but was sometimes hard to find in that it introduced me to a magical weird without bugging me down with all the infinite details of that world - in fact it's the kind of book I like to read now. It gives you enough to feel like you know Breveny well, but leaves you with enough questions that you want to read on for more." I think this is one of my favourite reviews ever!